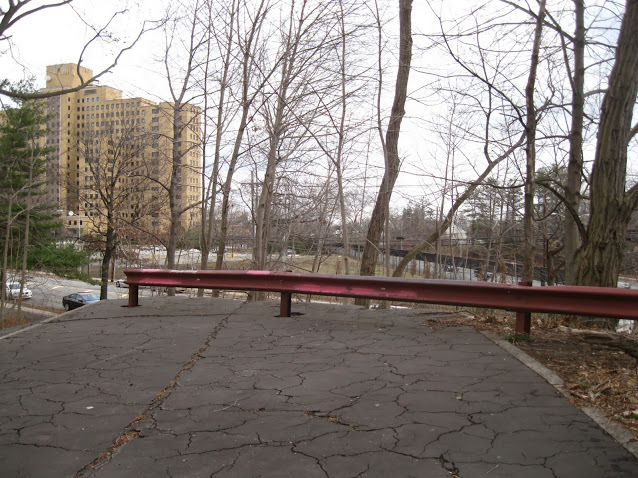 Today the Motor Parkway greenway ends abruptly at Winchester Avenue. If you can get to it, the greenway can take you to many destinations in Eastern Queens and throughout the 5 boros. Nassau County is building a greenway of its own along the abandoned Motor Parkway. This new Greenway will provide a continuous path between Lakeville Road and Bethpage State Park. Nassau is seeking funding for their proposal, and have already built a 1-mile long demonstration path on Salisbury Drive in Eisenhower Park. Nassau County's demonstration path in Eisenhower Park, along Salisbury Drive. Photo Courtesy Michael Vitti. Soon, when the Nassau County Motor Parkway Greenway opens, there will be 2 great greenways nearby without an easy means of getting to them - or between them. Our solution is very simple - it turns out the original Motor Parkway (before it was torn down) would have connected many of our neighbors to the part of the Motor Parkway that still exists. Almost all of this land is in the hands of various government agencies - so building a connector between these two great greenways - the Motor Parkway Greenway in Queens and the Nassau County Motor Parkway Greenway currently being built, requires using government land in a new way.